Kashmiri separatist are under severe pressure for a long time now. The separatist triumvirate, however, has been special targets. Mirwaiz Umer Farooq was permitted to preside over the Friday congregation at Jamia after almost two months. Malik had been shuttling between jail and home for last many months, the latest being on the eve of Eid. Syed Ali Geelani has not seen the mosque for years now. In this backdrop when on September 6, 2017, people started assembling inside the historic Jamia Masjid Srinagar to listen the three leaders of, popularly termed as Joint Resistance Leadership (JRL), it surprised many people. Though the gathering was modest and only two of the three could reach the venue, it still seemed an enigma. “Has the government replaced its heart?” one commuter watching the people assembling quipped. As the two made their speeches, it was National Investigation Agency (NIA) that was focus of their speeches along with the “media propaganda” unleashed at the behest of the government. Malik made a huge speech that made it to the newspaper front pages, the next morning. 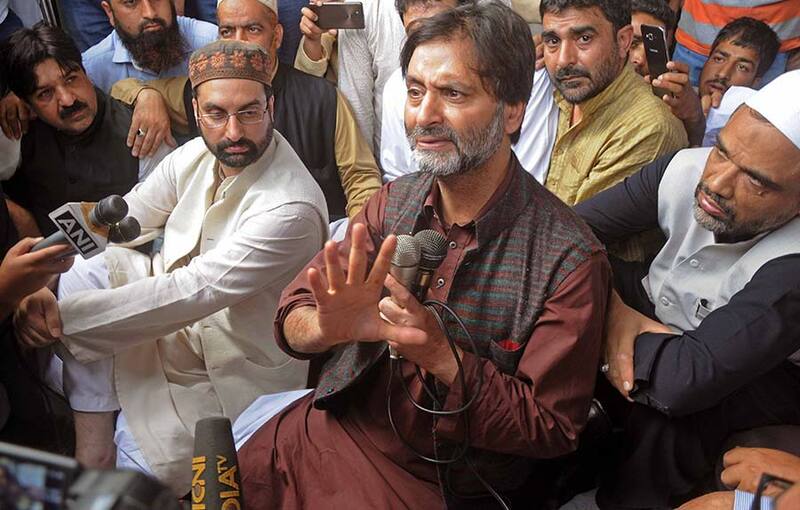 Terming NIA as Gabbar Singh of Sholay, Malik said the Agency has this illusion that people would fear it, not knowing Kashmir has witnessed the worst in last few decades. Geelani also spoke on phone. The takeaway from the rare pblic meeting was that the trio will fly on September 9, 2017, to Delhi and volunteer arrest to the NIA. As the two leaders were talking to the supportive audience at Jamia, NIA was busy in raids at 27 places across India, at 11 locations in Kashmir alone. The day was apparently dedicated to the raids on individuals who are associated with cross-LoC trade, a barter exercise since October 2008. The blind trade between J&K and PaK bypasses the formal banking structure and almost all the trading processes thus giving the governmental systems as much of advantage to manipulate as it gives to the traders. Raids were carried out across Srinagar: Maharaj Gnj, Nowhatta, Umarabad, Zainakote, Nowgam, Jawahar Nagar, Bemina, Buchpora, and at one place in north Kashmir. The raids carried out in connection with an FIR (RC-10/2017/NIA/DLI of May 30, 2017) registered in Delhi to block hawala funding to Kashmir separatists, yielded a cash of Rs 2.20 crore and “a load of incriminating documents”, as a Jammu newspaper put it. Seizures include bank account details, off shore travel details, phones and laptops too. The next day raids continued. In Delhi, Kashmir Bar Association leader Mian Abdul Qayoom was being questioned for the whole day, he was then released after two days, as the sleuths in Srinagar were scanning the homes of Agha Syed Hassan in Srinagar and Ghulam Nabi Sumji in Bejbehara. 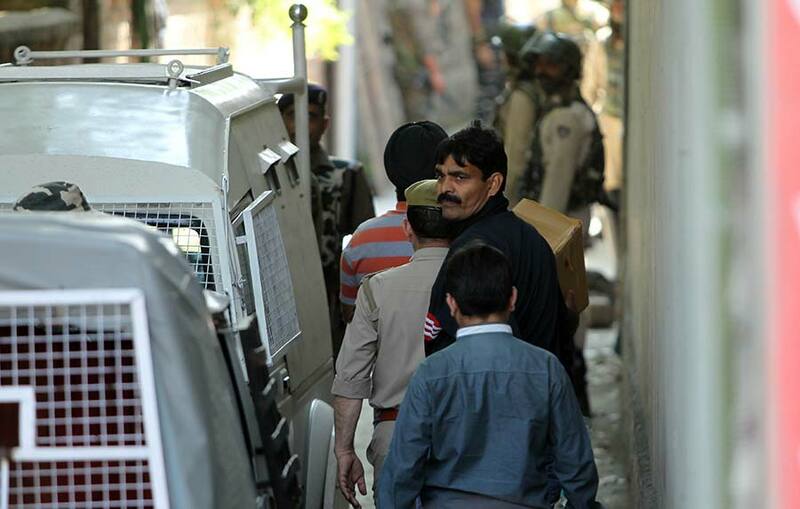 At 11 places in Kashmir, Jammu and Gurgaon, raids were carried out. People generally remained indifferent towards the raids since May as there was no reaction. But it has started impacting life now. The High Court is not functioning as lawyers are on strike against their leader being summoned to Delhi. Separatists have already called for a day long strike on Sunday. The first reaction came in Budgam when the followers of Agha protested marking an early return of NIA from the town. On Friday, the town was on protest – a rare occasion, as lot of Shia Muslim clerics came to Srinagar for a symbolic protest. All these developments took place in the backdrop of reports that one of the already detained persons in the formal custody of NIA has turned an approver. Already seven separatist leaders, businessman Zahoor Watali and a freelance photo journalist Kamran Yousuf are with NIA. Malik moved out of jail the next day. Though it is yet not known if the government will permit them to fly to Delhi and open a new front for Delhi in Delhi. Incidentally, the Home Minister Rajnath Singh is scheduled to fly to J&K for four daysThis will be followed by the visit of Dr Manmohan Singh as well. Perhaps it was in backdrop that the PDP in Srinagar had started managing an audience. It seemed the party was busy preparing a public rally to offer an audience to Singh, to recreate the Vajpayee moment, or at least a bit of it. Even the informal channels from Delhi were suggestive of possibilities of Delhi opening up part of its cards. But the situation took interesting turn barley two days ahead of the scheduled arrival of Home Minister. The rally plans were abandoned. Reason: Delhi was not interested in any public meeting in Srinagar, though the initial plan was there. Apparently Home Ministry idea was not approved by the PMO. “Seemingly, central government is happy that its pro-active stance is yielding better,” a government source said. “Incoming days, the situation will be slightly more tightened. The velvet is off the fist and it will squeeze a bit more.” A commoners indifference towards raids, fall in incidents of stone pelting and reduced attendance in militant funerals are apparently the new barometer of a “changed” Kashmir. While there is possibility of a few or many individuals currently being investigated by the NIA actually faced the law, there is consensus among entire political elite that it will not help plucking the sentiment off. Investigating the funding route has remained a consistent exercise throughout and it has already been done by Income Tax and Enforcement Directorate (infact Shabir Shah’s case is being tackled by the ED). But Delhi has remained unchanged. “NIA is doing great job and has established itself as a credible investigation agency,” Home Minister Raj Nath Singh said. There were reports that at one stage, the state government had tried non-co-operating with the NIA and had started making suggestion, which did were rejected. Currently NIA is mostly working in J&K. This has started hitting the ruling party within. Voices within the party suggest that they will be unable to face the opposition when they would be accused of “superimposing a central agency on the state police force” in the next election. Though there is not much difference between NC and PDP, the two Kashmir parties, over the inevitability of tackling “terror funding”, the concerns are still mounting within the ranks. “It was ok that the NIA would go to biggies but it is now going door to door,” one senior minister said. “It could become just a routine.” Interestingly, political grapevine suggests the NIA is probing some people from Kashmir’s unionist clan as well.